Free-motion quilting is something that I still find very difficult. I can FMQ small things, but anything larger than a place mat is beyond me. I have made sandwich blocks for practice, and I try to practice at least 3 days out of the week. Lori Kennedy at Inbox Jaunt, provides great FMQ tutorials on her blog. Recently, I started viewing tutorials on how to use FMQ rulers. Today, I visited the Austin Sewing and Quilt Shop. I purchased my Juki sewing machine at this shop, so I went to ask about the FM ruler foot for the Juki. The shop will be having lessons on using the ruler foot in January. I do not know enough about the effectiveness of using a ruler for quilting. Before I go through the expense involved in using a ruler for FMQ, I was wondering if anyone could share their thoughts and experience. I spent the morning watching Hallmark Christmas movies and painting more seasonal rocks. Hi Chela … take the class … you never know – it might be right up your alley! 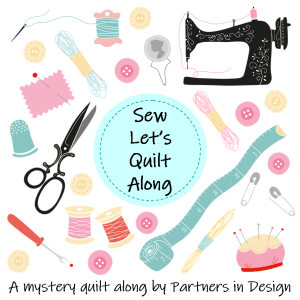 I so want to work on being more confident in free motion quilting. That sounds like a wonderful morning – watching Hallmark movies and painting! The rocks look great! Thanks…it was enjoyable. I still find FMQ so intimidating and difficult, but I’m going to continue working on it.